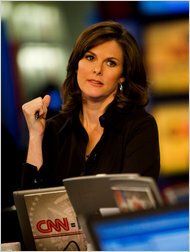 Earlier this week, prime time television host Campbell Brown announced she was leaving CNN after two years with the network. I admit, I knew very little about her except that she was on CNN (this is partly to blame for my lack of cable). Yet she captured my attention after reading this article posted on The Huffington Post website, announcing her departure and her coinciding statement. Since then, it seems she has drawn overwhelmingly positive responses. Tweets about her resignation were popular and extremely positive, and even mainstream media was also supportive and generous. People appreciated Brown’s honesty and directness, something that is often lost in similar statements by public figures and organizations. Had she given other reasons for her departure, or not give a reason at all, the pubic would began to speculate at the real reason why she was stepping down. She would probably fall victim to the media, who would more than likely draw out her resignation by digging to find the details and reasons behind her departure. It would be one drawn out topic amid today’s gossip, or probably just would have gone under the radar. Instead, Brown’s resignation seems to draw a large amount of positive response and even sympathy. Brian Stelter wrote an article about it in the New York Times, saying “she is leaving with an extraordinary amount of candor” and even suggesting she was a casualty of the ratings, not a cause. We will probably see her back on our T.V. sets sooner than later, as another network should be quick to pick her up. And what do we learn from this, as communicators? Forget the spin. Forget the excuses. In a world full of “fluff” and hidden agendas, honesty and openness is refreshing. It draws much more respect. It should also be something that we as comminicators, and even people, should strive for. « Is There a Time for Sports and Politics to Mix?